The flight from Mumbai to Jaipur takes little more than hour and a half, but it crosses four Indian states. More than 300 million people on an area four times that of New Zealand. From Maharashtra’s long Arabian Sea coastline to Gujarat’s lions. From Madhya Pradesh’s “heart of India” to Rajasthan’s “land of kings”. Certainly too much for the fleeting traveller to absorb, so we limited ourselves to two cities in Rajasthan: Jaipur, the “Pink City”; and Agra, the “City of the Taj”. If you glance through the photos we took of the two cities, you’ll notice stark differences. In Jaipur, perhaps still influenced by our experience in Mumbai, we focused our eyes (and our camera) mostly on the mayhem and grime of the streets, overlooking the beauty of the pink buildings that give the city its nickname. In Agra, fascinated with Taj Mahal’s love story, the same mayhem and grime of the streets passed largely unnoticed. Did we get used to the chaos, or did we learn to see beyond it? A little bit of both, perhaps. Jaipur was painted pink to welcome prince Edward VII and Queen Victoria when they visited the city in 1876. The tradition lingered and nowadays residents are required by law to stick to it. We’re not talking Barbie pink though: it’s a warm, worn-out coral that blends the city’s skyline into the surrounding mountains. Thanks for that photo, Jules! 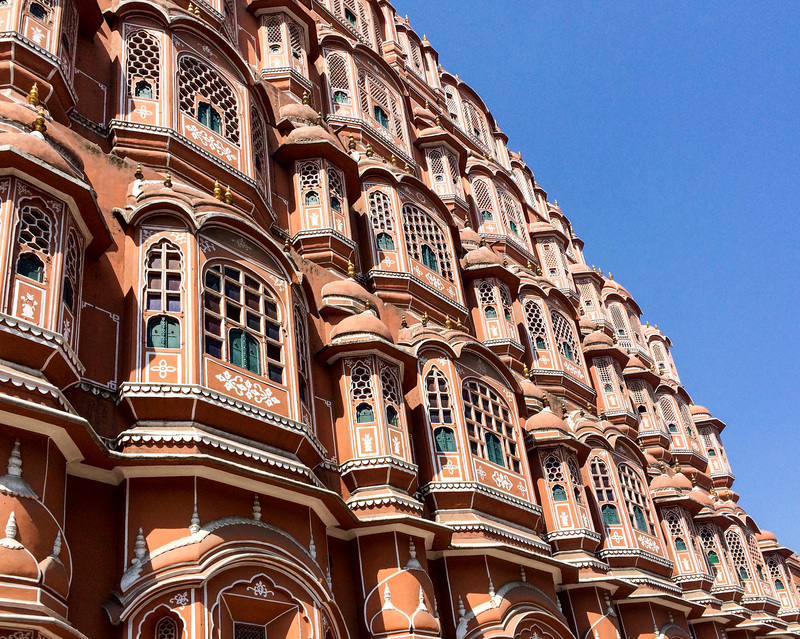 The Hawa Mahal, or ‘Palace of the Winds’, is probably Jaipur’s best known landmark (by the way, ‘mahal’ means palace. There’s a lot of them in Rajasthan). The small windows served a dual purpose: they let the ladies from the royal court observe street festivities without being seen, and they helped cool the palace in the summer. Inside, there’s a big courtyard with a fountain, surrounded by intricate layers of passages and balconies. The palace’s architect wanted to honor both India’s Hindu and Islamic heritage, so he combined elements of Rajput architecture (such as the domed canopies) with the same cues of Mughal architecture we’ll see in the Taj Mahal. From Hawa Mahal’s balconies you can see the tip of Jantar Mantar, a giant sundial that can tell time with an accuracy of two seconds. Surrounding it there’s another twenty or so astronomical instruments, all built int the 18th century for things like tracking the location of stars and predicting eclipses. Next up was the Amer Fort. It’s about 10 km (6 miles) from Jaipur, so we took a tuk-tuk. Traffic in Jaipur is even more chaotic than in Mumbai, since a three-lane road will have six tuk-tuks side-by-side, all gunning for that narrow gap between two buses. Our fearless driver would occasionally scream a “no rules, no rules!” justification over the cacophony of horns. Jules replied with “… but great curry?”, but the guy was apparently not a scotch fan. The Amer Fort (or the Amber Fort, it seems that the translation from the Hindi ‘आमेर क़िला’ is not straightforward) sits high on a hill, next to the Maota Lake, and served as the royal residence of the region’s Maharajas (‘great kings’ or ‘ great rulers’). The surrounding fort is magnificent, but we ended up not visiting the inner palace. In many Indian monuments, foreigners pay between five and fifty (!) times more than local tourists. Each will have his own opinion about charging different amounts for the same service. Personally, it makes me feel like a little wallet with legs, to be milked whenever possible. Perhaps I’m not the only one: India receives some 8 million foreign tourists per year, the equivalent to 6 tourists for every 1000 inhabitants. China receives 20 visitors for every 1000 locals, and Thailand an incredible 370! We opted instead to get ourselves lost in Jaipur’s backstreets and alleys. Out of reach of tourist guides and tuk-tuk drivers, we walked around largely unnoticed. Have a look at the photos: sure, there’s piles of garbage being rummaged by various animals, but there’s also that same electricity we felt in China, the thrill of a country that’s advancing by leaps and bounds. The following dawn we headed to Agra, on our first train ride in India. It was definitely not like this. There was hot tea and cold air conditioning, making the four hour trip breeze by. Once in Agra, we overcame our reticence with differentiated ticket prices and went into the Agra Fort. The first structures of this ‘Red Fort’ go back to the 11th century, and it constantly evolved throughout history. The combination of red sandstone and white marble makes it a thing of beauty, but it lives constantly beneath the shadow of the Taj Mahal, which can be seen from many of its windows. Ah, the Taj Mahal. Rabindranath Tagore, an Indian Nobel laureate, called it “the tear-drop on the cheek of time”. Grief-stricken by the death of his beloved wive (one of three, actually), the emperor Shah Jahan ordered the construction of this incredible ivory-white marble mausoleum. When he died he was buried alongside his wife, and his tomb is the only element breaking Taj Mahal’s perfect symmetry. You might think that such a public affection of love feels out of place in India’s modest and reserved culture. In fact, the Taj Mahal used to be shier that it is today: tall trees and towering foliage surrounded most of the building, offering just a glimpse of it. In the early 20th century, Lord Curzon, a British viceroy, replaced the lush vegetation by the British styled gardens that surround the Taj Mahal today. I’ll let our pictures tell the rest of Agra’s story. In the meantime we’ll be flying to Goa, in the South of India, for the final leg of our Indian trip! This one took us back to the Gili Islands! There are a zillion pictures like this one on Instagram, but it is truly the best spot to admire the Taj Mahal! I also feel the differentiated prices should not be there. Is it a common practice also in Karnataka? Loved this post and it brought back many great memories! My passion is candid photography but sometimes, portraits work 🙂 I absolutely love film and have my darkroom equipment in storage back home in Brisbane. Perhaps you can teach me post-processing! I’ve stopped uploading photos as I’m re-designing and re-building this site as we speak (another reason why I’m so behind with posts on my Image Earth Travel site). Agreed! You’ll teach me street photography and I’ll teach you Lightroom. I feel I got the better end of this deal 🙂 I’ll keep an eye out for the redesigned photography site! Cool, it will take me a couple of months yet. Loved your pics! It’s like revisiting these places.